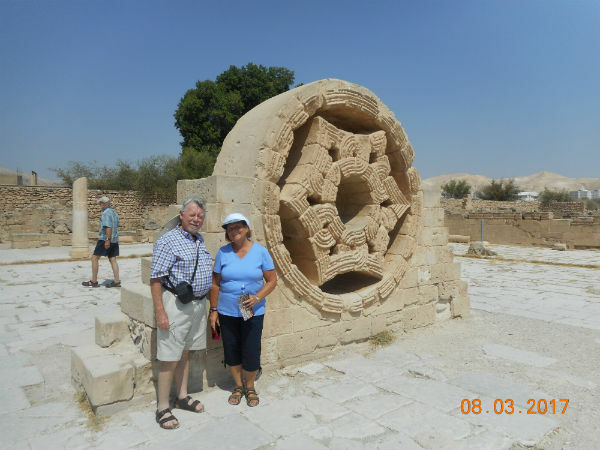 Neil Himber has been reading, studying and praying about peace in Palestine for 30 years. A member of Holy Redeemer Parish in Warren, along with his wife, Marge, his interest was first piqued when he became involved with a lay Franciscan group in Cincinnati. “We were an activist group, and the bishop’s peace pastoral came out,” Neil remembers.The Challenge of Peace: God's Promise and Our Response (May 3, 1983) addressed peace and war in the nuclear age, at a time when tensions between the United States and the Soviet Union were significant. Developed with the help of an array of experts in many fields, it was widely received both in the church and in the secular world as a prophetic document. Neil’s group began offering presentations on the pastoral to local parishes. Through his studies, Neil learned the Russians were supplying the Arab states with nuclear weapons while the US was doing the same for the Israelis. He was amazed to learn Israel had nuclear weapons. “As Catholics, we’re called to be peacemakers,” he says. “I take that seriously. With that in mind, the Himbers signed up for an alternative tour to the Holy Land through Friends of Sabeel North America, or FOSNA, in 2017. It’s an experience now deeply seared into the activist lives they have chosen. Their guide made sure they saw all the key tourist sites. But the group also met with Palestinian and Israeli groups to enhance their understanding and to capture the culture and flavor of one of the most politically charged regions in the world. The Himbers have been to Guatemala and El Salvador. They’ve cruised the Rhine, studying Alpine mystics. And they’ve been known to stand in solidarity with immigrants on street corners in their hometown of Youngsville. But the trip to the Holy Land presented them with many opportunities, including one unlike anything they’d ever experienced before. Each morning, thousands of men who live in Palestine cross the border into Israel to work. Some must rise as early as 2:30 am to make it through a narrow border passageway in time for jobs that start 5 or 6 hours later. Videos on YouTube make it clear the daily expedition is an assault on human dignity. During their pilgrimage, Neil and Marge agreed to join the men one morning. “It was like being in a kennel,” Neil says. As she approached the end of the journey, Marge says she just let go and allowed the people behind her to push her through. The men quickly headed to buses and vans, preparing to complete their daily journey. They had left their homes in the dark and would not return until it was dark, once again. The situation in the Middle East is beyond complex. For the Himbers, inching through a tunnel, shoulder to shoulder with brothers subjected to a grueling ritual on the other side of the world, provided insights and understanding unavailable to most. Parishes or groups interested in a presentation on the alternative tour can contact the Himbers at marge.himber@outlook.com or n99himber@gmail.com. For a fuller story on their FOSNA tour, visit the diocesan news site at www.nwpaCatholic.com.